Frannie Lewis has a lot of bad history with men, starting with the first one she ever met. She’s watched her aloof father disappear in the summers to work with a traveling carnival, seen her mother grow ever more suspicious and resentful. All her life, Frannie has kept their secrets and told their stories. Now thirty-six, she remains a pawn in their longstanding marital chess game—and at this point, it has devolved into a grudge match. Even so, she longs to be a mother. Motherhood seems like a chance to reinvent what it means to be a family—to rectify her childhood, to start fresh. Still single, she isn’t sure if this will ever happen. When her father is diagnosed with cancer, she decides to have a baby on her own to encourage him to live and to please her mother, who still grieves over the baby she lost twenty-five years ago. But Frannie, who grew up with such a feckless father, wants her child to have a good one. She’s just met Jude, who’s lonely, earnest, and kind, but he comes with baggage of his own. He lost his son in a tragic accident, and his ex-wife Rita can’t let go of him. Waiting in the wings is Hugh, her oldest friend and long-time confidante. He’s the easy choice, but Frannie suspects that he and her family’s past are too precariously intertwined. As both her father’s secrets and Jude’s are dragged into the light, Frannie and Rita make a startling agreement. In the wake of it, Frannie must choose between two separate narratives. She can relive her parents’ story, which is sad but safe and known, or forge ahead and tell her own—even though she has no way to see the ending. YOU AND I AND SOMEONE ELSE is both a lyrical, bittersweet love song to the South and a careful study of love itself, using that recognizable--but in Schachner’s capable hands, amazingly fresh--territory of the family. In Frannie’s world, love is not a birthright; it must be learned. I cried when Schachner’s characters failed and cheered when they succeeded, having felt their epiphanies as if they were my own. This is a book that redefines parenthood and responsibility, and does so unapologetically. I admire it for its insight, its sly humor, and its careful, hopeful heart. Make this your next read. 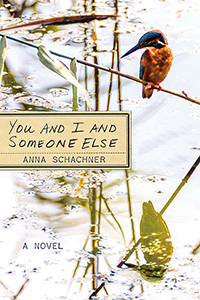 In the tradition of Alice Munro, Anna Schachner explores the mysteries of family with unflinching humor and a poet’s ear for language. Driven by an intricate and compelling plot, YOU AND I AND SOMEONE ELSE develops complex characters and relationships that reveal the emotional and psychological truths of secret-keeping. If this is her first novel, I’m already waiting for the second. YOU AND I AND SOMEONE ELSE is a wonderful novel, with incandescent characters, brilliant writing, and a heart as wide as the sea, where the story begins. Schachner has created a warm and intricate world in which we share souls and dreams. You will absolutely love this book. I did.